'Make a difference in the world, ' are the last words Maggie Gilligan's father ever says to her. They form a legacy that she carries in her heart, years later when, at the age of fifteen, she tries to better the lives of Dublin's largely forgotten poor. 'Don't go getting distracted, now, ' is what Daniel Healy's father says to him after seeing him talking to the same Maggie Gilligan. Daniel is more than distracted. He is intrigued. Never has he met anyone as dismissive, argumentative . . . as downright infuriating. A dare from Maggie is all it takes. Daniel volunteers at a food kitchen. There, his eyes are opened to the plight of the poor. It is 1913 and Dublin's striking workers have been locked out of their jobs. Their families are going hungry. Daniel and Maggie do what they can. Soon, however, Maggie realises that the only way to make a difference is to take up arms. The story of Maggie and Daniel is one of friendship, love, war and revolution, of two people prepared to sacrifice their lives: Maggie for her country, Daniel for Maggie. Their mutual sacrifices put them on opposite sides of a revolution. Can their love survive? 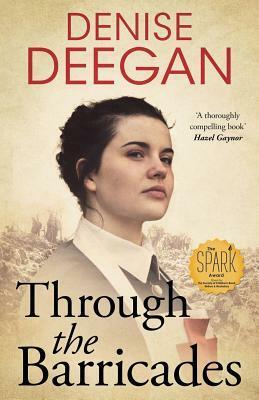 Denise Deegan lives in Dublin with her family where she regularly dreams of sunshine, a life without cooking and her novels being made into movies. She has a Masters in Public Relations and has been a college lecturer, nurse, china restorer, pharmaceutical sales rep, public relations executive and entrepreneur. Denise's books have been published by Penguin, Random House, Hachette and Lake Union Publishing. Denise writes contemporary family dramas under the pen name Aimee Alexander. They have become international best-sellers on Kindle. Find out more on www.denisedeegan.com.